Abdullah had on Monday said the National Conference will bring back the nomenclature Wazir-e-Azam (Prime Minister) and Sadr-e-Riyasat (Governor) in the state. Slamming the National Conference (NC) for its reported demand for a separate Prime Minister for Kashmir, Prime Minister Narendra Modi on Monday termed it as a serious issue and sought an answer from the Congress. Former Jammu and Kashmir Chief Minister and NC leader Omar Abdullah on Monday said he will work to restore the titles ‘Wazir-e-Azam’ (Prime Minister) and ‘Sadr-e-Riyasat’ (head of state) in the state, triggering an angry reaction from the Prime Minister. Addressing an election rally in Hyderabad, Modi demanded that the Congress and other constituents of the ‘Mahagathbandhan’ should respond to this statement made by their ally. Modi said the National Conference wanted to turn the clock back by creating a pre-1953 situation. “Do you accept this demand by an ally of the Congress? Will any Indian accept this,” he asked the crowd at the L.B. Stadium here. 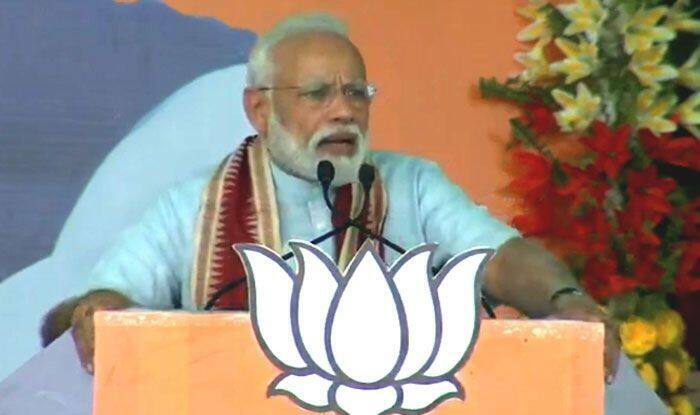 The Prime Minister was addressing the rally as part of the BJP’s campaign for the April 11 elections to 17 Lok Sabha seats in Telangana. The Secunderabad Lok Sabha seat in the state capital was the only seat won by the BJP in 2014. “This mentality of the Congress strengthened the anti-national forces. Because of the mentality, they raise questions on air strikes and surgical strikes and it was because of this mentality that they met the Chinese envoy during the Doklam standoff,” Modi said. The Prime Minister also vowed to foil all conspiracies. “As long as Modi is there, he will not allow your conspiracies to succeed. Modi will stand as a wall between the country’s enemies and the people,” he said. Modi recalled that after the imposition of Governor’s rule in Jammu and Kashmir, the National Conference and the People’s Democratic Party (PDP) stood against the government of India and opposed conducting panchayat elections. He pointed out that 70-75 per cent of polling was held and 30,000 candidates were elected who were running panchayats. “Kashmiri people boycotted those who boycotted the elections,” he said. The Prime Minister also targeted the Telangana Rashtra Samithi (TRS) and its ally Majlis-e-Ittehadul Muslimeen (MIM). He said the focus of the TRS government was not on development but on the growth of vote bank and the Chief Minister’s family. In an obvious reference to TRS’ election symbol “car”, he said KCR may be sitting in the car but the steering was in the hands of MIM. “But there is a big speed-breaker called Majlis. They don’t understand the language of development. Day in and day out, they remember only Modi. This ‘chowkidar’ is giving them sleepless nights,” he said. Modi also said that the steps taken by his government to protect the sisters and daughters of the country from “repressive mentality” have angered his opponents. He recalled the criticism he had to face for bringing a bill in the Parliament to ban the repressive tradition of triple talaq. “I am appealing to the victims and those sisters and daughters scared of triple talaq to support us. We guarantee your protection,” he said.